No offense, Asus, but when a company puts a netbook's name on an ultra-thin, ultra-light computer, it's like the first time grandma danced to Who Let The Dogs Out at a wedding. Trend over. Yes, today the MacBook Air is much, much lamer, but the Eee brand name is marginally more cool. The Asus Eee PC (1008HA), a 10-inch netbook, is just 1-inch thick and 2.8lbs in weight. 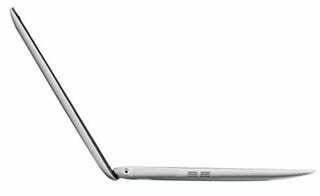 It also features the beveled design of the MacBook Air, with its curving chassis that thins around the edges. Asus isn't the first netbook manufacturer to go after a thin design, as MSI did the same thing with their X-Slim. But Asus takes the cake for most convincing press shot. Unfortunately, the processor, price and release date are still unannounced. So crank up the Macarena and enjoy the pics.